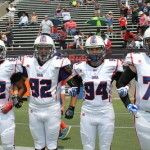 Louisburg Middle School eighth-grader Brayden White (92) goes out onto field at Hall of Fame Stadium as one of the team captains during the National Development Team game in early July in Canton, Ohio. White was recently selected to represent the United States and participate in the 2016 International Bowl in Dallas. Brayden White lives for the game of football. It started when he attended his first Kansas State football game at the age of 2 months and has since grown into something most athletes his age only dream about. Brayden is ready to take the field on the national stage – as an eighth-grader. Brayden, a student at Louisburg Middle School, has been selected to represent the United States 15-and-under division team for USA Football and participate in the 2016 International Bowl against Canada on Feb. 3 in Dallas. If the stage wasn’t big enough, he also will be playing in one of the biggest venues in the National Football League – AT&T Stadium – home of the Dallas Cowboys. To get to this point, Brayden put in a lot of work and his road to USA Football started in late May with a simple tryout. Brayden and his family were made aware of a tryout at Piper High School that would allow him to be able to compete for a spot on the USA National Development Team. Standing at 6 feet, 2 inches and weighing around 215 pounds, Brayden didn’t look like the prototypical eighth-grader. “Some of the people there thought I was a sophomore in high school,” he said. 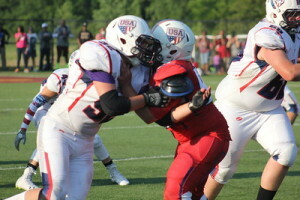 Brayden White (left) played a lot of defensive end during his time with the USA National Development Team in Canton, Ohio. The offensive and defensive lineman certainly made an impression on some of the coaches at the tryout as he was consistently going up against freshmen and sophomores during drills. “We were doing 1-on-1 and 7-on-7 type drills going down the line and I was going up against sophomores and I was winning,” Brayden said. Just days later, Brayden got the news he was hoping for as was he selected for the National Development Team. He, along with his family, made the trip to Canton, Ohio, for the six-day camp that ended with a game at the Hall of Fame stadium in early July. Brayden worked on both sides of the ball, and although most of his time was spent as a defensive end or tackle, he also played some right tackle on offense. To start his week, Brayden and his teammates practiced three times a day and watched film. There were a total of four developmental teams, and on the third day, the teams played each other in mini 20-minute games during the jamboree setting. Of course, the week ended with an actual contest as Brayden’s “White” team went up against the “Red” squad. The game was broadcast on the Internet which gave his family and friends a chance to see how he stacked up against the rest of the competition. The announcers listed Brayden as one of the “Top 5 Players to Watch” on his team. He also was selected as one of the team captains. “I was in there with freshmen and sophomores and I thought I did OK against them,” he said. “There were times where the running back would get away but those were some of the fastest kids that I have ever seen. His performance during the week-long camp left his parents, Nick and Melissa, with some memorable moments. Then in early September the news Brayden had been waiting for finally came – he was headed to Dallas to represent the United States in the International Bowl. The International Bowl, which will be broadcast on ESPN3, has featured alumni that have went on to play in the NFL, such as Tampa Bay quarterback Jameis Winston and St. Louis running back Todd Gurley. Although the game isn’t until early February, the players will travel to Dallas a week early for practice, before competing in a series of jamborees and official international games. It is an opportunity Brayden knows doesn’t come around often and one that he put a lot of effort into. Brayden will still be one of the younger players on his 15-and-under team when he travels to Dallas, but he is not worried about any of that. He just wants to play the game, do his best and hopefully it leads to something bigger in the future.